Architecture and design of the building is stunning and guaranteed to be able to make you amazed and fascinated. China ancient culture combined with a prominent religious nuances. 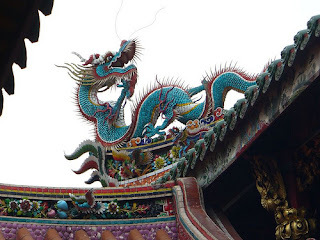 When translated in English, Longshan means 'dragon mountain'. 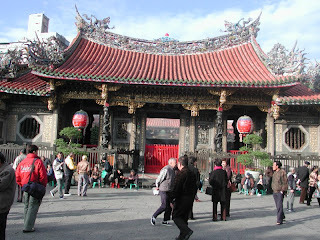 Longshan is the oldest Buddhist temples in Taiwan and is known as the Forbidden City in Taiwan. The temple is dedicated specifically to the spirits as Goddess of Mercy, Guanyin. Temple is located in the Lukan was also known as a meeting place of the gods as there are hundreds of gods that were worshiped in this religious place. In addition to Goddess Guanyin, the Goddess Matsu sea and Ewa war Kuan Kung is also worshiped in Longshan. Not only pilgrims visiting the shrine, there are many tourists from around the world who come because they feel curious and want to see the temple directly. It also often hold festivals and celebrations. There is usually a lit incense as offerings to the gods.